Typically when shopping, customers may not think about how their purchases are making an impact in their community. However, the Caring Corner Gift Shop and Good Cents Store recently showed just how much of an impact that shopping at their stores can make. 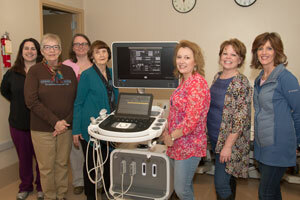 The volunteer staffed businesses donated $100,000 to Sidney Health Center for the purchase of a new 3D/4D ultrasound machine. The new state of the art machine allows the Sidney Health Center Radiology department the ability to service multiple patients at the same time, cutting down on wait time. The system’s powerful imaging capabilities support a variety of common exams, including OB, blood vessels, thyroid, and testicular exams. It also offers advanced imaging capabilities specifically beneficial in the evaluation of breast masses. “My volunteers at the Good Cents Store are extremely hard working and conscientious individuals who love that their work is helping bring much needed medical equipment to the area,” stated Carla Houchen, Good Cents Store Director. The Caring Corner Gift Shop and Good Cents Store are both staffed by volunteers and managed by Sidney Health Center. Volunteer duties include selling merchandise, handling cash, pricing and restocking items, and displaying merchandise. With overhead expenses kept to a minimum, funds raised through the stores help to purchase much needed medical equipment at Sidney Health Center. The Caring Corner Gift Shop is located in the main entrance at Sidney Health Center. The retail gift shop is open Monday through Friday from 9:00 a.m. to 4:00 p.m. The Good Cents Store is a second-hand store, located at the end of East Main in Sidney with store hours: Monday through Friday 9:00 a.m. to 4:00 p.m. and Saturday 12:00 a.m. to 3:00 p.m. In honor of National Volunteer Week, Sidney Health Center wanted to recognize all compassionate volunteers that play an important role in providing excellent care to our patients, residents and guests. Sidney Health Center offers a wide range of volunteer opportunities for individuals that are committed to community service. Currently, there are over 250 volunteers that help in various departments and facilities at Sidney Health Center. In addition to over 20 volunteer members on their Board of Directors, the Foundation for Community Care relies on volunteers to help with a variety of fundraising efforts. “Volunteers help us with nearly everything that we do. From organizing and attending special events, assistance in mailing campaigns, and spreading the mission of quality care in Richland County; our volunteers are the lifeblood of our organization,” stated Gina Heckey, Senior Executive, Foundation for Community Care. Other specialty trained volunteers include those that serve through the Ambulance Service, Pastoral Care and the Hospice department. After completing a 15 hour training course, Hospice volunteers offer companionship by sitting and visiting with patients allowing families an opportunity to take a break. The volunteers may also complete errands for the patients and families if needed as well as assist with mailings and other activities in the Hospice office. Volunteers through the Pastoral Care services are trained pastors in the area that offer chaplain care. Ambulance service volunteers complete an EMT training class and State and National testing to receive their license before serving their communities. Sidney Health Center is also blessed by numerous individuals and groups that donate items to various departments. The OB department is often gifted with handmade hats, blankets and burp rags that are passed on to new families. The Emergency Department has been gifted comfort items that are given to patients including stuffed animals, blankets and coloring kits. Cancer Care patients have received beautiful quilts and kits that contain personal items. If you would like to make a difference by volunteering at Sidney Health Center, please call the volunteer services office at (406) 488-2116 and you will be directed to the appropriate department volunteer coordinator.